The business centre La Defense, in the shape of larger version of the Arc de Triomphe. 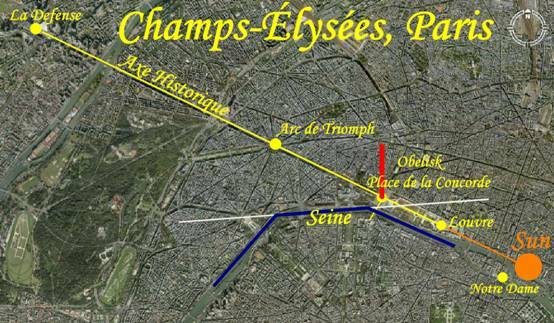 There are twelve roads extending from Place d’Etoile which may be a reference to the 12 signs of the zodiac since the square is actually called the ‘Star Square’. Since the Axe Historique aligns with the Sun on the pagan celebration day Lugnasadh, we can rest assured that the Axe Historique has an astrological significance. Hence like Washington also Paris has it’s own ancient Egyptian obelisk situated near the river, in this case the Seine. But the location of the obelisk at the bank of the Seine River is remarkable. Place de la Concorde with the Paris obelisk resides exactly in a bend in the river where the river starts to run parallel to the Axe Historique parallel to the Louvre museum. The Seine would cross the Axe Historique exactly at the place of the obelisk if it hadn’t been for the bend in the river. Esoterically one could say that the river ‘crosses’ the path of the Sun, albeit not a solstice or equinox sun, but a cross quarter day sun’s sunrise. The esoteric symbolism of the obelisks ‘crossing’ the river due to their inherent alignments, are therefore similar for both Washington and Paris. The central obelisk at Place de la Concorde is flanked by two fountains. The two fountains and the obelisk reside on a line perpendicular to the Axe Historique. This line leads to the bridge ‘Ponte de La Concorde’ across the Seine. This means that the obelisk with the two fountains is connected to the Seine by means of this bridge. 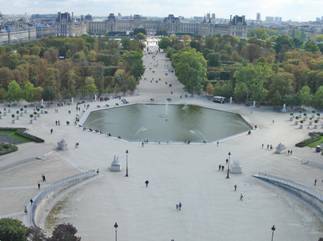 In addition a huge pond with a diameter of 68 meter in the shape of an octagon is situated on the Place de la Concorde. The obelisk is placed inside an oval within a larger octagon. At the 8 corners of the latter octagon statues are placed representing the eight largest cities of France. The cathedral the Notre Dame de Paris just 1500 meters south of the Louvre museum is built on an island in the Seine and is aligned to the 115º azimuth of the Axe Historique. Facing the Sun on Lugnasadh (7th of November) the Notre Dame has a perfect eight pointed cross placed on the apsis roof which welcomes the rising Sun on this special day. Although the Axe Historique does not align with a solstice sunrise or sunset, on the summer solstice the setting Sun crosses the Axe Historique at an altitude of 9º. This means that a spectator standing at the Louvre museum on the summer solstice would see the setting Sun just above all of the historical monuments on the Axe Historique. Seine ‘crosses’ the Axe Historique exactly at the Place de la Concorde with the obelisk. The obelisk at Place the la Concorde is one of the three obelisks called the needles of Cleopatra. The name is a misnomer since these obelisks did not belong or have anything to do with Cleopatra. Another of these needles resides in London on the Victoria embankment of the river Thames. In London the obelisk is virtually placed on the river. The third needle resides in Central Park New York. The authors did now discover any interesting alignments for the obelisks in both London and New York.